Born in Istanbul, and none the worse for the wear! 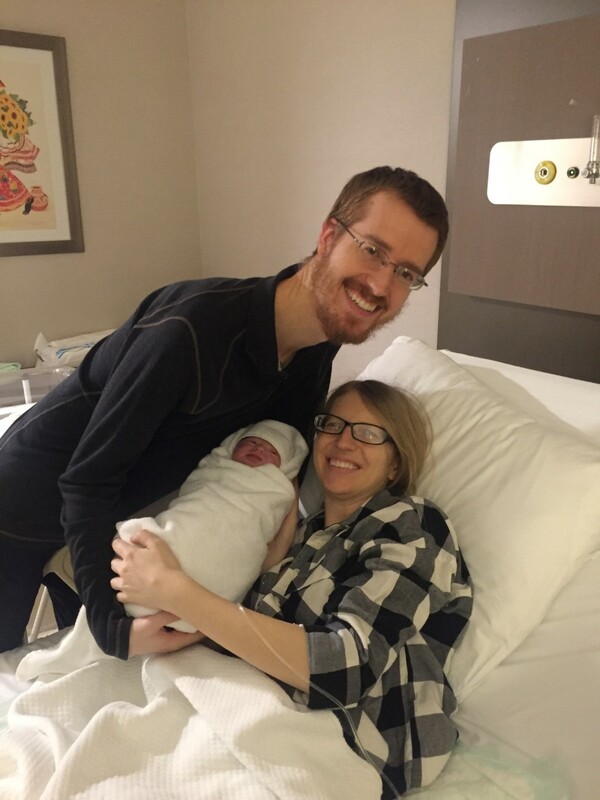 Having a baby while on the road and continuing to travel with a newborn was a big decision, but travel and becoming parents have been the two most important things we’ve wanted for a long time. We decided it was worth it to face the challenge. Luckily, the Internet is an amazing place and there are lots of stories of people having children in strange locales and traveling with babies if you look. We read lots of those, and they gave us the confidence that this whole thing is doable, even if it’s not a very traditional choice. So now we’re sharing our story. The three of us by the Hagia Sophia a few days after the birth. We decided to have our baby girl in Istanbul, Turkey for several reasons. First of all, we knew we’d be in Europe for the Camino in September, so we started looking in that general area for cities that might work as a good birthplace. It was also important to us that we be able to stay in one place for about three months, six weeks pre-baby and six weeks post-birth, which narrowed down our options quite a bit—most of Europe is part of the Schengen area, which means you can only be in any of those countries for a combined total of three months out of every six. Since Spain is one of those countries and we’d be there for a month on the Camino, none of those would work. So we broadened our search to nearby places, but outside the Shengen area. After a lot of searching, Istanbul ended up being the most convenient place with good hospitals and reasonable prices. 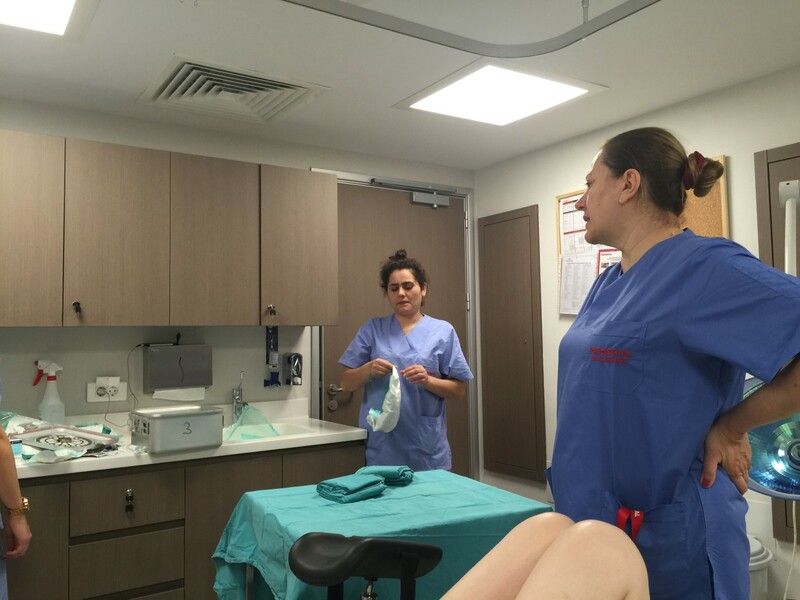 Some of the people we emailed in Istanbul regarding cost warned us that giving birth in a good hospital could be very expensive without insurance, probably around $3,000 or even up to $5,000. If you’ve looked at birth costs in the U.S., even with insurance, you probably think that’s just as funny as we did. One thing people ask us about all the time is citizenship. Unfortunately, Annabelle wasn’t born in a country that grants automatic citizenship to people born there (which is called Jus Soleil). She is not a Turkish citizen, just a plain ol’ American. There actually aren’t that many countries that do that anymore. North and South America mostly do, but once you get out of those continents, there are only a couple (and based on mortality rates, giving birth in Cambodia just isn’t worth the bonus citizenship). We considered going somewhere like Lima for the birth, which would give her Peruvian citizenship, but with our plans to walk the Camino and visit Europe, that would mean a long flight rather late in the pregnancy, and it just wasn’t worth it. She gets to put down Turkey as her country of birth on forms, though, which is pretty cool. 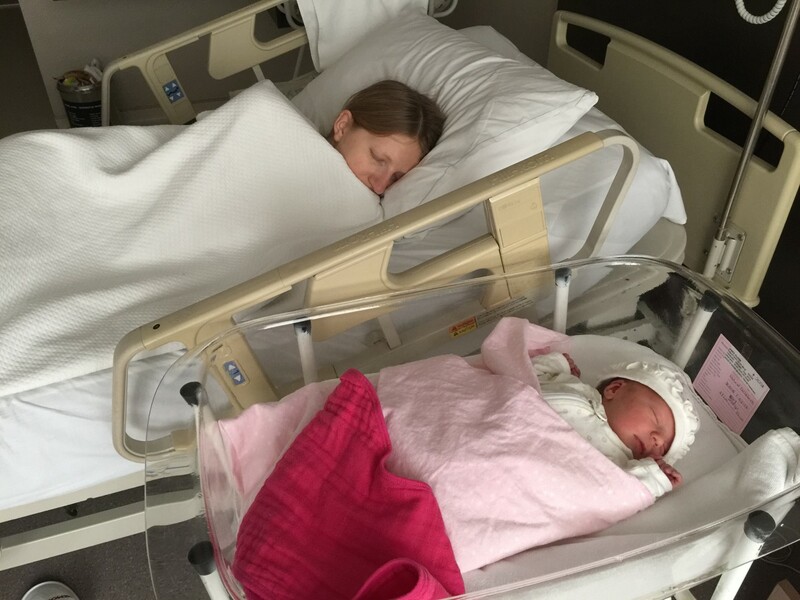 Six weeks before Annabelle was due, we flew from Zagreb, Croatia to Istanbul. 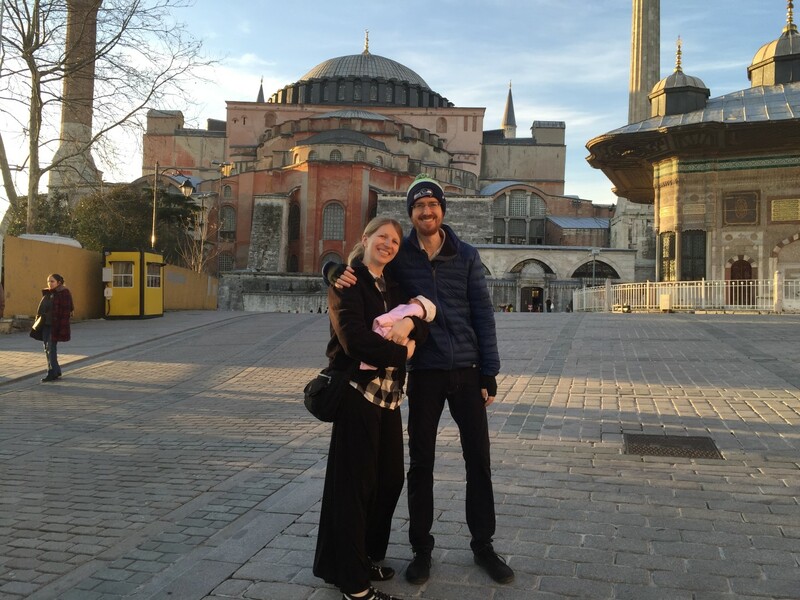 We spent the time until her birth walking around near the Blue Mosque and Hagia Sophia, enjoying the holidays and visits from friends, and riding the trams up to see the doctor for regular check-ups. We had all been pretty sure I was going to have a late baby, so none of us were convinced it was actually labor. Still, I started tracking the pains just in case. It didn’t take long to realize they were consistent, and were coming around 7 minutes apart, so we decided to check with the doctor and go to the hospital (again, just in case). We got to the hospital a few minutes after midnight, figured out where to go after some miming sessions with a security guard and was put on a monitoring machine. At 12:40 I was admitted, but my doctor (who was still at home and just translated the night midwife’s information to me over the phone) told me I was only 1cm dilated, so we assumed we were going to be there for quite awhile. My mom had stayed home to get some sleep, so we texted to let her know they were admitting me, but we had time. Joe: You should know that nobody at the hospital spoke much English. Ali’s doctor did a little translating for us while she was on the phone, but besides that, we were on our own. Once Ali was taken to her private room to wait, some people came to get me, and insisted in Turkish and with gestures that I come with them. This seemed normal; we’d need to get her signed in, though I didn’t want to leave Ali. The next thirty minutes or so consisted of several people trying to mime information to me, one middle-of-the-night-phone-call so one guy’s friend could partially and unsuccessfully try to translate for us, and me signing a thick stack of documents that were all written in Turkish. I could have been signing away my firstborn, for all I know. To this day, I really have no idea what any of those forms said, but I’m 90% sure it’ll never come back to bite me. Finally I got reception, and tried Google Translate on one phrase they were trying to get across to me. The result? New backwards exit fee is charged in the meantime. Thanks, Google. I just nodded, like it made total sense, and rushed back up to see Ali, convinced I had missed something crucial. While Joe was gone, I was trying to stay cool and collected as the contractions got more painful, and a couple of nurses asked me a bunch of messily-translated questions I didn’t know the answers to (seriously, I have no clue how many centimeters tall I am. Not only do I not speak Turkish, I don’t speak metric, either). By that time, I didn’t much care, either. Write down whatever you want, I’m in labor! Our doctor, and her assistants. By the time Joe got back, things had started getting pretty intense and I was no longer anywhere near cool and collected. Definitely on the opposite side of the spectrum. Though maybe an hour had passed since I got checked in, things were moving quickly. I wasn’t going to have the long hours of labor I had been led to expect, and as much as I’d read and watched about labor, I was not prepared for this crazy-train. My doctor showed up and told me that my labor was moving too fast and it was too late for an epidural—I originally hadn’t been planning on getting one, but my attitude had changed drastically in a very short time, and I was pretty grumpy when she told me that. Holding Annabelle, shortly after the birth. Just before two in the morning, Joe texted my mom that we were going into the delivery room, and she marched out of the AirBnB in the middle of the night in a city she’d been in for all of a day, armed with the hospital’s address and a US $20 bill to look for a taxi. 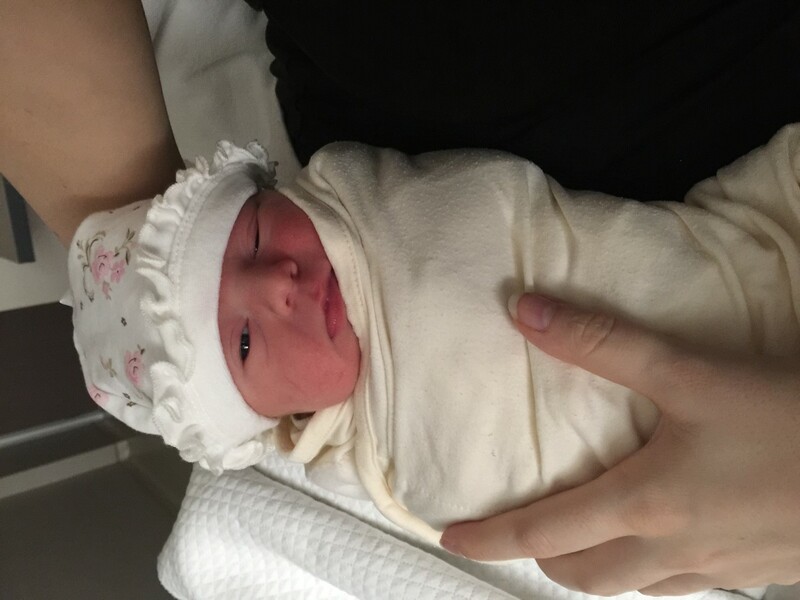 By 2:20, just over two hours after getting to the hospital, I was holding our new baby girl. My mom arrived right as we left the delivery room and were headed back to my room. Because we had washed the clothes my mom brought for Annabelle that afternoon (thinking we had days, if not a week or more before Annabelle arrived), they were all still wet, so Annabelle spent her first hours wrapped in a towel instead of cute little outfits. It was a crazy night, to say the least, and started us on an entirely new adventure as parents to this brand new little person. We spent the next two days hanging out in the hospital, communicating with nurses via Google translate and hand-gestures, and honestly, it was fine. It was an adventure. People thought having a baby in another country was brave, but really, with the exception of a few funny moments (Joe swears the forms he signed could have indentured our first-born for life and he’d have no idea), giving birth in Istanbul couldn’t have been that different from the U.S. The facilities were nice, the medical care was top-notch, and everyone took great care of us and our baby. Of course, in the U.S. I probably wouldn’t have been asked how many centimeters tall I am while fighting through painful contractions. So I guess that’s one point in America’s favor. Bonus: Annabelle was called our “Turkish delight” by one of the hospital staff, which I think is totally adorable and will definitely use at some point during her teenage years. Aw congratulations for Annabelle! (sorry pretty late – 1 year later), yeah totally I loved the phrase ‘Turkish delight’ hahah!